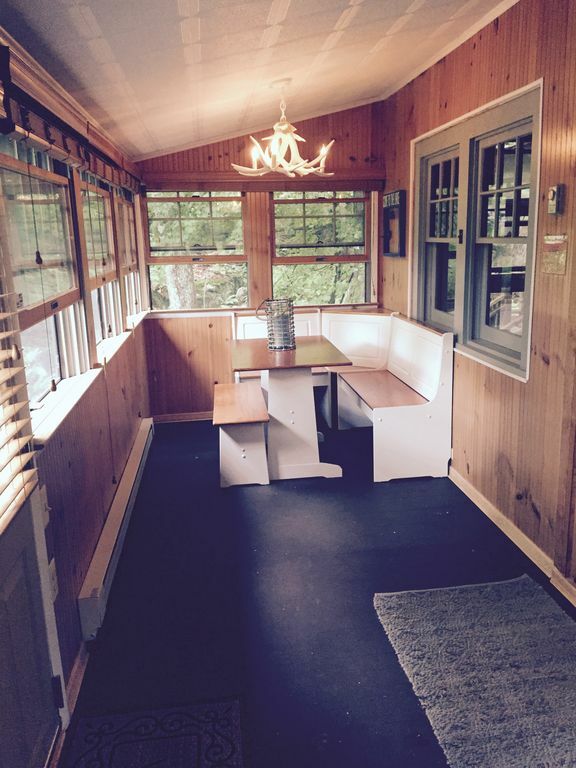 Enjoy a relaxing getaway in the heart of the Catskills!!! During your stay take in all that the beautiful mountain and lake scenery has to offer in the Summer, Fall, or Spring! Just a short walk from the cabin is a beautiful natural waterfall and right up the road from there is the private smallwood lake . Or for more active recreation, walk to the private community tennis courts or take a swim in the roped off private lake beach! Or just relax and play board games and cards (all provided) on the enclosed porch; Watch TV or a movie on the new flat screen TV; Cook a delicious meal in the updated kitchen with groceries bought at one of the many local farmer's markets! -2 bedrooms: 1 w/full sized bed (sleeps 2),1 with pop up trundle twin beds(sleeps 2), 1 full futon on porch (sleeps 1) 1 queen sized pull out sofa sleeper (sleeps 2), 1 twin futon in den. Just come relax and enjoy! I liked being in the woods, the quiet, seeing the deer but the property was small, tiny bedrooms, old, and stuffy when we arrived. Never found the lake. We paid a premium price for a less than premium property.